Create Your Own Oval Champion Chain. These bright gold champ chains are perfect to recognize winners of anything you can dream of. 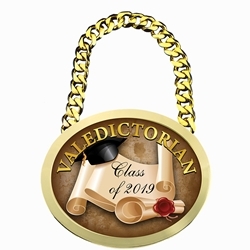 Create your own champ chain has endless possibilities for creating a truly customizable award that will be a showstopper. These award chains are also the perfect way to brand yourself or your company at trade shows or corporate events. Everyone will be wondering who those cool people are walking around with the awesome chains! The Champ Chain is made of heavy duty zinc metal. The plate is 5-5/8" x 4-5/8" and comes with an attached 7/8" x 34" bright gold chain. Award comes in a black satin lined presentation box. For a $25 artwork charge we will place the artwork you provide or use stock images from our library and email you a proof for approval. Or you can also select the "logo on file" option and you can provide the artwork in a camera ready format in a template we will provide after ordering at no additional charge. Add the quantity of chains to the cart by clicking "personalize my award".